I am looking forward to giving another workshop at Whole Foods! This one will take place on 3/25/2014 at 6:00PM at the Whole Foods in Northridge. 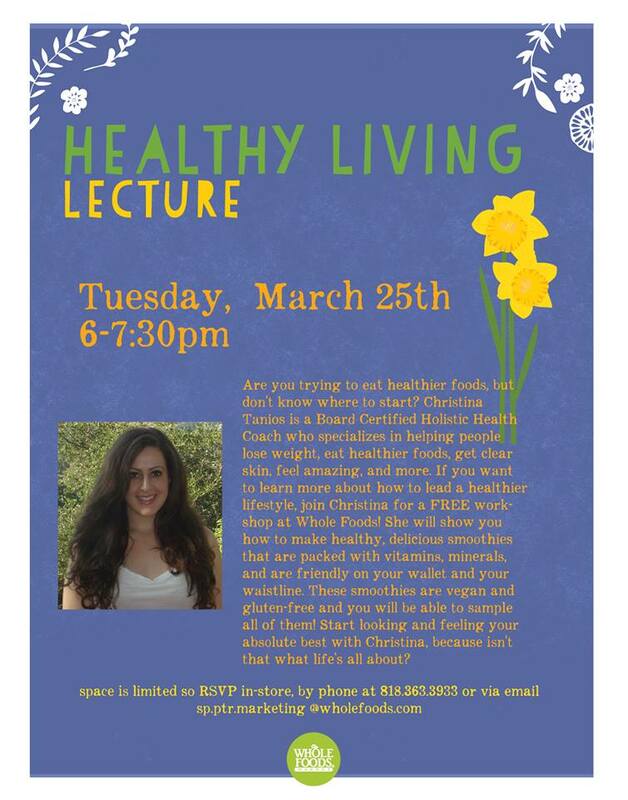 I will be talking about how to make healthier food choices so that you will feel energized, look amazing, reach your ideal weight, and become healthier and happier than you’ve ever been! Join me for this workshop and you’ll be able to sample three delicious smoothies! You will learn all about the vitamins and minerals that make certain foods so healthy and good for us to eat; you’ll also learn about how to prepare these foods, shop for them on a budget, and make them in as little time as possible! Now that spring is here, fresh, delicious fruits and vegetables are in season. These seasonal fruits and vegetables are exactly what we should be cleansing our bodies with on a daily basis. Learn how to crowd out processed foods and replace them with whole foods instead – it’s easier than you think! Get rid of extra weight, sugar cravings, and fatigue and replace it with lots of energy, health, whole foods, and happiness! I have so much fun each time I give a workshop at Whole Foods; everyone is always so warm and welcoming and the last time I gave a workshop at the Whole Foods in Pasadena, Jay, the marketing manager said that he’d, “never seen the crowd so engaged during a presentation at Whole Foods.” He went on to say that he was happy that everyone was so interested in what I was saying and he genuinely felt like they were excited to be learning new health information and inspired to make simple changes in their diet and lifestyle – wow! I am so happy to keep hearing positive feedback, so please join me for another fun and informative workshop! Please RSVP – I’ll see you there soon!